Police and wildlife experts are becoming "increasingly concerned" at the number of cases of protected wildlife being disturbed by drones. They say some drones are being flown dangerously close to breeding birds and animals at sites in Scotland. Seals have reportedly been chased into the sea at protected haul-out sites, which risks their pups being crushed. Concerns are also being raised about nesting birds becoming panicked and plummeting off cliffs into the sea. The Partnership for Action Against Wildlife Crime (PAW) Scotland said it is important drone operators understand the law. Some sites are given a special status which makes disturbance - even accidentally - a crime. Andy Turner, wildlife crime officer with Scottish Natural Heritage (SNH), said: "There have been several incidents involving drones disturbing seals at designated haul-out sites. Likewise, there have been anecdotal reports of drones being used to film seabird colonies and raptors. "While the footage from drones in these circumstances can be very spectacular, the operator must be mindful of the effect on wildlife. Birds like the golden eagle and mammals like dolphins and whales are protected from disturbance all year round, while others are given additional protection during the breeding season. 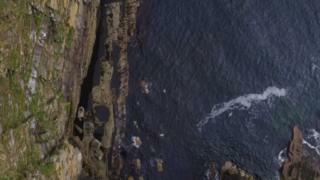 RSPB Scotland said birds like guillemots and razorbills in particular could be panicked by drones close to cliffs and that the implications could be "almost catastrophic". The charity uses drones itself for habitat and vegetation surveys and said they can be used positively. Head of Investigations Ian Thompson said: "Watch the animals. You will get a sign if you are causing them any stress, you'll see from their behaviour. "You might see birds take flight or suddenly lift their heads and run off or walk off. "If the birds start altering their behaviour, that shows that you are disturbing them and then it is time to move a drone away." Drones are widely used by professional filmmakers to capture footage of wildlife. But Orkney-based wildlife cameraman Raymond Besant, who counts the BBC's Autumnwatch among the TV programmes he has contributed to, said understanding the subject is key. He said: "Drones are quite noisy so you do need to keep a good distance away from seals particularly, otherwise they will just go into the water. "The main aim really of wildlife film-making is to try and film animals displaying natural behaviour.